Kudos to Rhino for releasing the third and final Genesis box set. Longtime Genesis collaborator Nick Davis, with help from the band, has spent the past few years remixing the Genesis studio catalog in Dolby 5.1 surround sound, and along the way he’s also made some new stereo mixes, giving the band an opportunity to “fix” things in the original mixes they were never happy with, without actually re-recording anything. The second consisted of their later albums, “Genesis” through “Calling All Stations,” an album noteworthy primarily for the absence of Collins behind the mike and drum kit. But Rhino saved the best for last — “Genesis: 1970-1975,” the earliest Genesis albums, the sumptuous ones with Peter Gabriel as the frontman. And I’m here to tell you that if you’re a fan but held off buying any of these, start with this one first. The surround sound mix of “The Lamb Lies Down On Broadway” is worth the price of the whole set. The DVD also features an added surprise — a recreation of the multimedia slide show the band used on the Lamb tour, interspersed with rare photos and film clips from a few of the shows. Even on the stereo mixes, you hear things you never heard before — more clarity in the solos, the depth of the lead vocals, backing vocals that weren’t there before. On Lamb, for instance, Phil Collins was doing a lot more behind the drum kit than I’d heard before, and I say that as someone who has listened to that album so many times I know every little sound by heart. I can sing the entire set from memory — and yet it all sounded new to me. The first real Genesis album, “Trespass,” improves immeasurably in this package. Suddenly the playing sounds clearer and better, leading to an appreciation of an album that was under appreciated before. 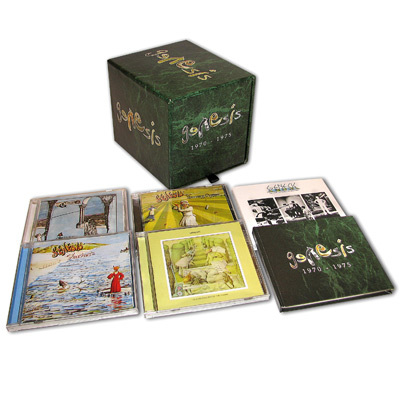 All the box sets are exquisite, but feel free, if you’re a fan of “classic” Genesis, to start with this one.